Current events in France (#1) To better understand a country, it is useful to read its press and watch its TV. You can see what are the main issues for the people, what are the current controversies (the French are very good at that...). In this section, I try to register, month after month, the main topics for the French. WARNING ! The comments below do NOT reflect MY own opinion but are a tentative synthesis of what comes out from the French press and TV in a given month ! do express my own opinions on page Editorial ! This page concerns 2005 and 2006 : for 2007 and 2008, click here. 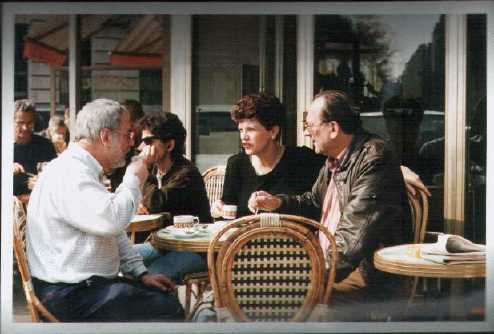 Webmaster Philippe Rochefort and wife Harriet discussing current world affairs in a French bistrot. Rock star Johnny Hallyday announces that he will move to Switzerland to pay less taxes : national uproar right up to the President of France ! For the first time, the Socialist Party nominated a woman, Segolene Royal, as its candidate for the presidential elections next Spring. As every year, the first page of all newspapers comment the literary prizes, the most prestigious going this year to foreign authors who write in French : Goncourt Prize to Jonathan Littell (American) for Les bienveillantes, Femina to Nancy Huston (Canadian), Renaudot to Alain Mabanckou (Congolese). Who says that the French are chauvisnists ? The 2007 presidential campaign is now omni-present with the two probable adversaries, N.Sarlozy for the Right and S.Royal for the Left, but also many other candidates, all of them making a lot of noise ; on a project of privatization of the gas utilitty Gaz de France, the Left submitted 137,347 amendments in the National Assembly (50 tons of paper...) ! France is doing much better than expected in the Football World Cup and everybody is in a better mood.... Of course everybody was shocked by the incident with Zidane, one of the most loved French personalities. Finally, the government is defeated and withdraws the controversial law after more than two months of demonstrations. The Prime Minister is ridiculed (and the jobless rate remains unaffected...). Huge student demonstrations all over the country to protest against a law creating a new labour contract (CPE = Contrat Première Embauche) aimed at reducing unemployment for people under 26 and less protective than the traditional CDI (Contrat à Durée Indéterminée) : read about it. and see a tentative explanation of this typically French social crisis. Most French universities are on strike. Read a column about how hard it is to be French and young ! The country is horrified by a villainous crime with ugly racist overtones: a multi-ethnic gang from a Parisian suburb kidnapped and killed a young Jewish shopkeeper after three weeks of torture ; the head of the gang, who called himself (in English) "the brain of the barbarians" managed to escape to his country, the Ivory Coast. the parliamentary hearings about the Outreau judiciary scandal (see December 2005) is broadcasted live every evening and illustrates shameful mistakes from all institutions involved. Following a large national debate about racism and colonialism, President Chirac proposes a national day of commemoration (May 10) for the historical crime of slave trade and its influence on racism (read more). Following the Nov. riots, a huge (and probably useful...) controversy on the colonial past of France. Read my editorial about it. Violent urban riots in the North-East suburbs of Paris spreading all over the country ; the country is appalled by the realization of this social and urban failure and the controversy raises about the zero-tolerance policy of Interior minister Sarkozy. As usual, the country is divided (note that in France, unlike in America, the poorest disticts are in suburbs and the richest in city centers). See more comments about the riots and see "la Haine", a premonitory film. France is worried about bird flu : by far the first producer of chickens in Europe, France is on the way from and back home of millions of migratory birds (see the controversy with European regulation about hunting...). Turkey, Romania, Greece : who is next ? A state-owned ferry company, SNCM (Corsica), is being privatized : unhappy workers hijack a ferry boat and the government pulls back ; read more about it. After a three-week strike which ruined the harbor of Marseille and the economy of Corsica, back to square one : the privatization goes on. End August/early Sept. : all French political parties hold their "universités d'été" (Summer universities) : this year one of the main issues is the survival of the Socialist party which supported the "Yes" vote to the European Constitution when most of its members voted "No" : France is the only country in Europe where the Socialist party did not become clearly social-democrat but remains officially "marxist"
President Chirac suffers a minor stroke : will he run again in 2007 (he will be 75...) ? Will he challenge Sarkozy ? Zineddine Zidane returns to the national foot-ball team : there is hope for the coming World Championship ! "Cecilia abandons Nicolas" : Nicolas Sarkozy did what French politicians never do : putting ahead family values and campaigning with his wife and son ; she runs away with a lover; the whole country cracks up !